This book provides the "nuts and bolts" background for a successful study of carbohydrates - the essential molecules that not only give you energy, but are an integral part of many biological processes. A question often asked is 'Why do carbohydrate chemistry?' The answer is simple: It is fundamental to a study of biology. Carbohydrates are the building blocks of life and enable biological processes to take place. Therefore the book will provide a taste for the subject of glycobiology. 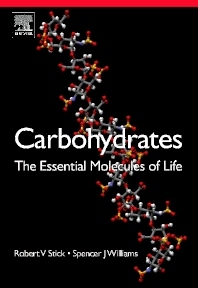 Covering the basics of carbohydrates and then the chemistry and reactions of carbohydrates this book will enable a chemist to gain essential knowledge that will enable them to move smoothly into the worlds of biochemistry, molecular biology and cell biology. Researchers, scientists, and advanced undergraduate and graduate students in biochemistry and organic chemistry. Robert Stick is a Queenslander by birth and completed his undergraduate and higher degrees at the University of Queensland. Following post-doctoral studies with Ray Lemieux and Sir Derek Barton, he took a faculty position at The University of Western Australia in 1975 and has since spent sabbatical leaves with Bert Fraser-Reid (Duke University), and with Bill Cullen and Steve Withers (both of the University of British Columbia).